Acne occurs most commonly during adolescence, affecting an estimated 80–90% of teenagers. While rate decreases in adulthood, around half of people still have problems in their twenties and thirties. About 4% continue to have difficulties into their forties. Acne typically appears on your face, neck, chest, back and shoulders. These areas of skin have the most oil (sebaceous) glands. Acne occurs when hair follicles become plugged with oil and dead skin cells. Pimples are raised red spots with a white center that develops when blocked hair follicles become inflamed or infected. Blockages and inflammation that develop deep inside hair follicles produce cyst-like lumps beneath the surface of your skin. Other pores in your skin, which are the openings of the sweat glands, aren’t usually involved in acne. Hormones. Androgens are hormones that increase in boys and girls during puberty and cause the sebaceous glands to enlarge and make more sebum. Hormonal changes related to pregnancy and the use of oral contraceptives also can affect sebum production. Genetic. Studies in twins show that genetic predisposition can play a role in who is affected. Diet. Studies indicate that certain dietary factors, including dairy products and carbohydrate-rich foods — such as bread, bagels and chips — may trigger acne. Chocolate has long been suspected of making acne worse. It seems that this may be more related to the content of sugar than the chocolate itself. Infections. Propionibacterium acnes (P. acnes) are suspected to contribute to the development of acne lesions, but its exact role in this process is not entirely clear. Many strains of these bacteria exist in the normal skin. Retinoids. Works by preventing plugging of the hair follicles. Antibiotics. These medications work by killing excess skin bacteria and reducing redness. Skin resistance is becoming more common. Dapsone (Aczone). This gel is most effective when combined with a topical retinoid. Skin side effects include redness and dryness. Antibiotics. For moderate to severe acne, you may need oral antibiotics to reduce bacteria and fight inflammation. Choices for treating acne include tetracyclines, such as minocycline and doxycycline. Combined oral contraceptives. Combined oral contraceptives are useful in treating acne in women and adolescent girls. The Food and Drug Administration approved three products that combine estrogen and progestin (Ortho Tri-Cyclen, Estrostep and Yaz). Anti-androgen agent. The drug spironolactone (Aldactone) may be considered for women and adolescent girls if oral antibiotics aren’t helping. It works by blocking the effect of androgen hormones on the sebaceous glands. Isotretinoin. This medicine is reserved for people with the most severe acne. Extraction of whiteheads and blackheads. Your dermatologist uses special tools to gently remove whiteheads and blackheads (comedos) that haven’t cleared up with topical medications. Chemical peel. This procedure uses repeated applications of a chemical solution to exfoliate, open the pores, inhibit P. acnes and reduce sebum production. NEW! Our MicroPeel Plus by SkinCeuticals is ideal for combination, oily, and acneic skin with mild to moderate post-inflammatory pigmentation. It works to promote skin’s renewal process to aid in the reduction of acne, and to improve rough texture, blotchiness, and uneven skin tone. NEW! Adult Anti-Acne System by SkinCeuticals. This take home kit includes three products: LHA Cleansing Gel (combination of glycolic acid and salicylic acid for pore decongestion), LHA Solution (exfoliating toner to decongest pores) and Blemish + Age Defense (prevents formation of acne by reducing sebum production, minimizes hyperpigmentation, and reduces the appearance of fine lines and wrinkles). Steroid injection. Nodular and cystic lesions can be treated by injecting a steroid drug directly into them. This improves their appearance without the need for extraction. Soft tissue fillers. Injecting soft tissue fillers under the skin and into indented scars can fill out or stretch the skin. This makes the scars less noticeable. Dermabrasion. The procedure of dermabrasion is usually reserved for more severe scarring. It involves sanding (planing) the surface layer of skin with a rotating brush. This helps blend acne scars into the surrounding skin. Laser resurfacing. This is a skin resurfacing procedure that uses a laser to improve the appearance of your skin. Platelet Rich Plasma. This procedure uses your own platelets (one of the blood cell types) to stimulate the production of collagen and improve the scars and hyper pigmentation. You or your loved one does not have to suffer from acne. 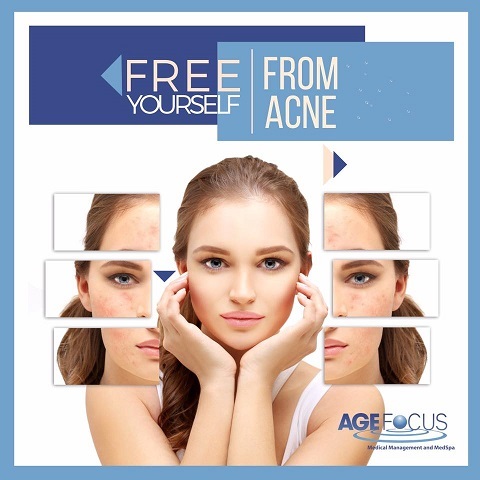 At AgeFocus we offer many treatments for adolescent and adult acne as well as acne scar treatment. Call for a free consultation (631) 243-3628.